Archaeological evidence of people using pepper goes back to at least 2000 BC in India. It is known that pepper was exported, but to what extent remains a mystery. Nonetheless, signs of an ancient pepper trade from India to Egypt have been found, including the peppercorns that had been stuffed into the nostrils of Ramses the Great (1303-1213 BC) when he was mummified. Certainly by 40 AD, the Romans had a thriving trade in spices, including pepper. Leaving the southwestern coast of India in July with the monsoon winds, Roman sea traders brought cinnamon, incense oils and pepper to their great commercial hub in Alexandria. When the strong monsoon winds switched in the fall, the traders rode them back. Whereas pepper has nothing in it that can plead as a recommendation to either fruit or berry, its only desirable quality being a certain pungency; and yet it is for this that we import it all the way from India! When Rome was attacked in 410 AD, to lift the siege of the Visogoths and prevent the city from being sacked, along with gold, silver, silk, and hides, the Romans paid “three thousand pounds of pepper.” Negotiations soon broke down again, however, and the siege was resumed. Eventually the Eternal City was sacked. Under the early caliphate this Islamic network matured to encompass most of the Indian Ocean world from East Africa to the southern coast of China. It carried . . . the beliefs of Islam . . . the Arabic language, shari’a courts . . . and shared commercial practices. Groves of trees in India [and the Caucus mountains] “guarded” by poisonous serpents. In order to harvest the pepper, the trees have to be burned, driving the snakes away and in the process turning the originally white fruit black. As the demand for pepper grew, so did its trade. By the 10th century, pepper had become important throughout Europe, and it is reported that the English King Ethelred II (978-1016) exacted 10 pounds of pepper from German spice traders prior to letting them do business in London. 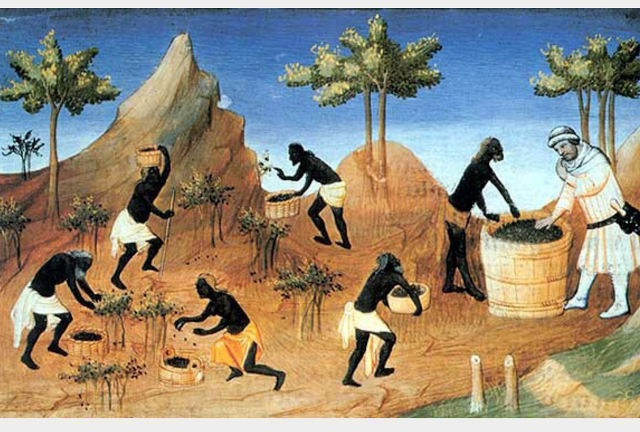 Arab traders were not alone on the sea, and by the Middle Ages, many other seafaring groups had joined the spice trade. By the 14th century Genoa had become a prominent commercial center with pepper as its primary commodity. 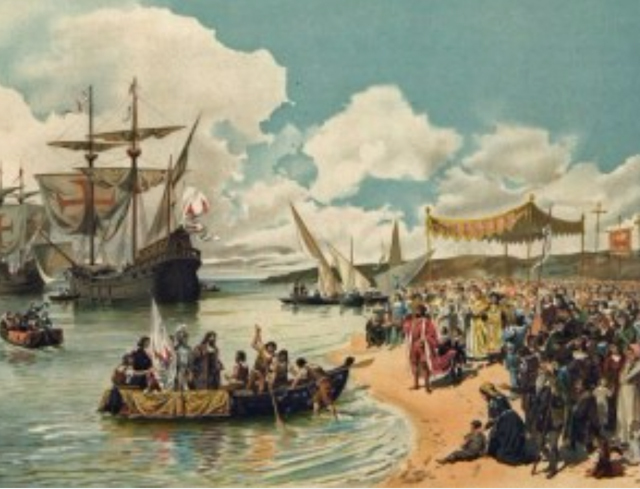 Between 1367 and 1371, over 40% of the value of all that entered Genoa from Alexandria came from pepper. Spice merchants from Alexandria brought pepper to Venice, as well, and by the end of the 15th century, over 400 tons of it every year. Sharp traders, “the Venetians marked up the price of spices an average of 40 percent during the fifteenth century.” Not alone in gouging the consumer, the Catalans of Barcelona extolled a 25% profit on the pepper they imported. Other major sources of pepper came from Constantinople, Cyprus, Syria and other ports of the Levant. The inhabitants of “Java Major” (Borneo, perhaps) collect spices from other islands, which are brought by merchants from Ceylon. In Ceylon they are sold to traders from “the Golden Khersonese” (the Malay Peninsula?) and then in turn to merchants of “Taprobana” (Sumatra?). This implausible eastern meandering shifts suddenly and more realistically westward in the fifth and sixth stages when the “heathen Mohammedans” (“heyden machmet”) from Aden buy the spices, which then pass through Cairo. the remaining steps involve the distribution of spices throughout Europe via Venice, Frankfurt, Bruges, and finally to retailers in Germany. As the British Empire rose in prominence in the tropics, it eventually took control of the spice trade with commercial groups like the British East India Company, supported by its dominant military. Today, Vietnam has emerged as the world leader in pepper production. For 2013, it exported between 130,000 and 135,000 tons of pepper at a value of around $900,000,000.